"I never buy anything premade anymore. I have to know what I'm eating. Ranch dressing mix is one that I miss. I perused many recipes before coming up with my favorite." 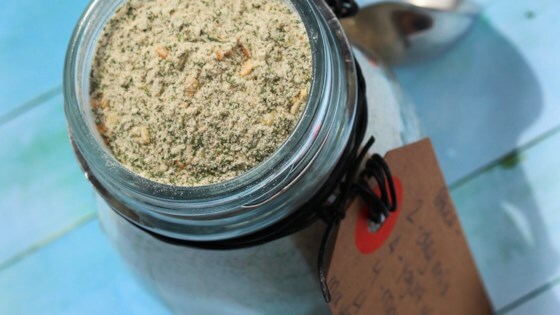 Mix the buttermilk powder, dried onion, parsley, chives, salt, garlic powder, dried celery flakes, white pepper, paprika, and dill together, and store in a cool, dry place. For a finer texture, place ingredients in a blender and pulse several times. These ingredients are easy to play around with. If you like more salt, add more. I love garlic, but this amount might be too overpowering for some. I also like to add cayenne when I'm looking for a kick. To prepare the mix as salad dressing, whisk together in a mixing bowl with 2 cups of mayonnaise and 2 cups of milk until smooth. To make Ranch Dressing I used 1/4 c. nonfat plain yogurt, 1/4 c. light Mayo and 1/4 c. skim milk. Mix with 2 T of the dry mix. Store in the fridge.